When Warm Bodies was announced (adapted from Isaac Marion’s novel of the same name) I originally thought it was supposed to be some kind of Twilight rip-off, except, you know, replacing vampires with zombies. Genius. However, as time went by, it turned out to be some kind of romantic-comedy. This didn’t sound any better to me, and so it really fell off my radar for a while. I had no intention of seeing it, but boredom is a dangerous thing, and so I reconsidered, and with absolutely zero preconceptions saved for the bare minimum of information on its premise I’d learned months ago, I went to see it. 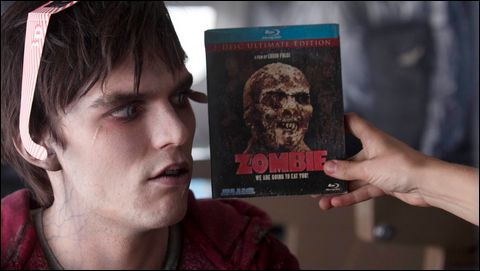 And I was pleasantly surprised, as Warm Bodies turned out to be a zombie movie with quite a bit of heart. R (Nicholas Hoult) is a peculiar zombie who has grown tired of his monotonous “life” and longs for the humanity that he lost long ago, along with his memories. The world has descended into a hellish world where zombies trawl the streets and the remnants of humanity take hold in a heavily protected bastion, and the daughter of the stronghold’s leader (played by John Malkovich) is Julie (Teresa Palmer), a young woman who detests the world’s current militaristic mindset. When her scavenger party is wiped out by a zombie attack, Julie finds herself rescued by the infatuated R, who finds that he may somehow be in love with her – feelings that are intensified when he consumes the brain of her ex-boyfriend, allowing him to experience the closest thing that a zombie can come to dreaming. As Julie warms up to R, the zombie slowly becomes more and more human, forming words, losing his stench, and becoming susceptible to pain, both physically and emotionally. The same phenomenon begins to affect the other zombies as well, much to the chagrin of creatures called “Bonies”, skeletal creatures who were formally zombies who gave up hope (for a somewhat ill-defined reason). Hope for what? For their humanity, and for love, apparently. It's cheesy, but it works. R and Julie have to work together to show both the humans and the zombies what this unconventional cure is, before they destroy one another. Warm Bodies is a movie that worked more as a drama than it did as a comedy. As a comedy, it left quite a bit to be desired. The jokes are never cringe-worthy, but they’ll either leave you unaffected or quietly chuckling. And it may have only been me, but I often couldn’t tell if something was supposed to be humorous or not. It’s admitted that this may be a personal flaw, but some tension was dissolved from the movie because the mere absurdity of some situations felt like it was attempting forced humor. For what was expected though (which was admittedly little), the film was actually quite poignant and, although not immensely so, profound. The characters aren’t complex, but they’re sympathetic enough, and the zombies, even empathetic. Their plight for acceptance and the using of them as allegories for common human desires and issues is what the zombie genre has always been about. The performances were effective, the pacing was good, and while the humor was hit and miss, Warm Bodies compensated by returning a pulse to the genre.